This year-long exhibition inside the Colosseum charts the nearly two millennia of history of Rome’s most famous ancient monument, dwelling not only on its gladiatorial origins but on its long afterlife – for example its re-use as a thriving commercial and residential hub in the early Middle Ages. Spanish-born Trajan, who ruled from 98 to 117AD, was the first non-Italian Roman emperor. A career soldier, he expanded the frontiers of the Empire, his successful Dacian campaign featuring prominently in the bas-relief frieze that spirals around the Column bearing his name. This exhibition in the Mercato di Traiano archaeological site nearby assembles busts, portraits, casts from the Column, coins and other artefacts to recount the trajectory of a new meritocratic brand of emperor after the dynastic misfits of the Caligula and Nero years. If you find yourself in Rome and haven’t yet caught it elsewhere on a world tour that began in 2015, don’t miss this exhibition, co-produced by Singapore’s ArtScience Museum, Science Gallery Dublin and Centre de Cultura Contemporània de Barcelona. Art and technology combine in a show that explores what it is to be human in a world of artificial intelligence, lifelike robots and genetic modification. Italian curator Cristina Cellini Antonini brings home a format she created in London in 2015: upcoming artists take over a hotel for three days, each one turning a room into their personal exhibition space. The venue for the first Rome edition is the Church Palace Hotel, a converted Renaissance-era palace near the Vatican. Easter is a busy time for the Pope – and a good time to get a glimpse of him going about his business. Masses are held at St Peter’s and St John Lateran, and there’s a Way of the Cross inside the Colosseum on the evening of Good Friday. You can see the pope’s schedule below. Marathon runners from all over the world descend on Rome for this annual fixture. There’s a 5km fun run for those not up to the full course. The city of Rome is one of the few in the world to have an official birthday – on April 21. To celebrate its legendary foundation on that day in 753 BC, the Eternal City throws a big party with fireworks, fancy dress and son et lumière light shows all centred on on the Capitoline, via dei Fori Imperiali and the Circo Massimo. This event sees more than 90 Roman museums and cultural spaces joining in this Europe-wide initiative and opening their doors, free, from 8pm to 2am. There are countless entertainments and events accompanying the late opening. You don’t need to be a cycling fan to be swept up by the citywide circus that will accompany the last stage of Italy’s answer to the Tour de France. After a three-day start in Israel, the race will wend up through Italy, with the Alpine stages almost certainly decreeing a winner before the final ten laps of Rome’s centro storico between the Colosseum and Piazza del Popolo. But those Roman cobbles could still provide last-minute upsets for Chris Froome and the other lads in Lycra. 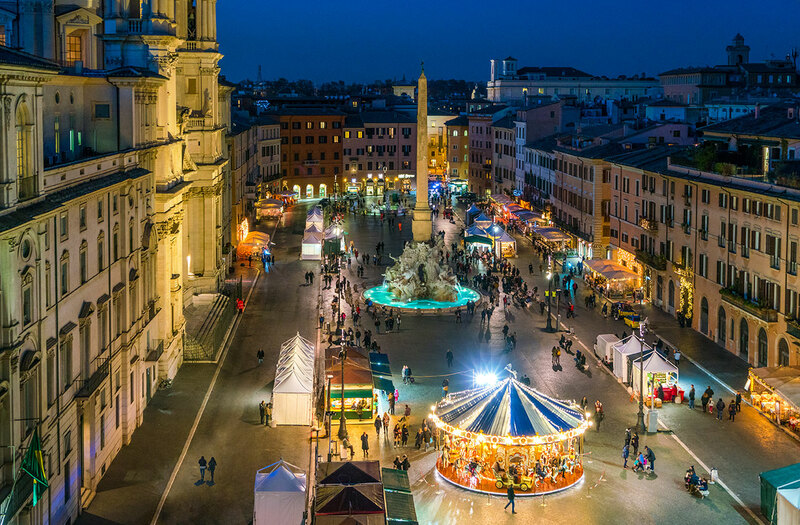 The ‘Roman Summer’ is the umbrella term for the citywide programme of open-air concerts, dance and theatre performances, cinema screenings and other events that animate Rome through the hotter months. Highlights include the Isola del Cinema film festival on Tiber Island. This annual arts event unspools a high-quality programme of avant-garde dance, music and drama events, bringing troupes, orchestras and acts from all over the world. For 10 days in October the Auditorium-Parco della Musica (auditorium.com) hosts dozens of screenings, debates and events, including film premieres and masterclasses by international movie personalities. © 2018 Paris.com All Rights Reserved.